Sometimes an unusual combination of flavors ends up being more than the sum of its parts. 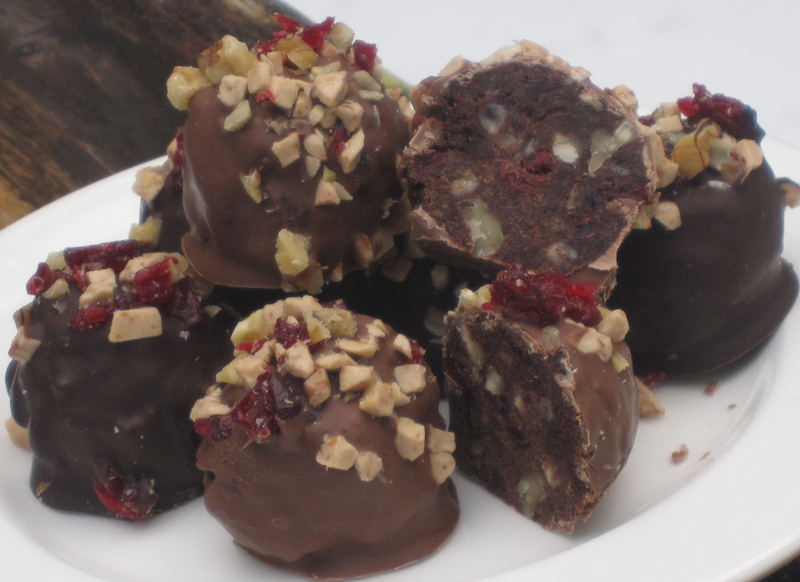 Tart dried cranberries combined with toffee bits, toasted walnuts, dark chocolate cake, and milk chocolate ganache equal one decadent cake ball. Dip half the batch in milk chocolate and half in semisweet, and sprinkle all of them with additional cranberries, toffee, and nuts. This is perfect for holiday gift giving. 1. Combine the cake with 3/4 cup of the ganache, 1 cup of the cranberries, 2/3 cup of the nuts, and 2/3 cup of the toffee bits. Test by compressing and tasting and add more ganache only if needed for flavor and moisture. Roll into golf ball–size cake balls. Refrigerate until firm. This can be done 1 day ahead; store in an airtight container once they are firm. 2. Line two rimmed baking sheets with parchment paper or aluminum foil. Toss together the remaining cranberries, nuts, and toffee bits. Melt the milk and semisweet chocolates separately in the microwave or double boilers. Dip the balls one at a time (half of the balls in each flavor), encouraging any excess chocolate to drip back into the container. Place, evenly spaced, on the prepared pans. Sprinkle a generous amount of the mixed topping on each cake ball while the chocolate is still wet. Refrigerate briefly until the chocolate is set. Trim the bottoms, if needed. Place each cake ball in a paper cup, if desired. Place in a single layer in an airtight container and refrigerate for up to 4 days. Bring to room temperature before serving. Note: For a fabulous variation, substitute dried cherries for the cranberries and substitute finely chopped blanched almonds for the walnuts.